Hi everyone! I am back today with a tiny review of a tiny book of poetry! 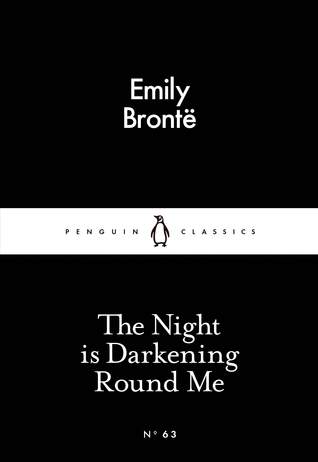 This cute little collection is an instalment of the Penguin Little Black Classics. There are 80 of these books in total by 80 different authors and they are each 80p. They were brought out as a celebration of Penguin’s 80th birthday and I think they are adorable! I own three in total; the one I am reviewing today which is a collection of poetry by Emily Brontë, The Beautifull Cassandra which is a collection of short stories by Jane Austen and The Tell-Tale Heart by Edgar Allan Poe. I have only read one so far but I will get round to the other two eventually as they are nice short reads. So now, onto the review! I am not much of a poetry lover, I have a great appreciation for it but I just don’t read it very often. That being said, I thoroughly enjoyed this small collection of poems featuring topics such as death, nature and life in general. Overall the selection of poems was put together very nicely, I felt like they read well as a group and I liked that they had similar themes. It has to be said that I failed to understand or connect with a few of them but I think that’s the joy of poetry; the ones you like are the ones that you connect with and the ones you don’t like you can appreciate for what they are anyway. I would say that the main reason that I didn’t like a few of them was because they were pretty long and my taste in poems could be described as ‘short and sweet’. I have three particular favourites that I would like to mention, the first being the 11th poem in the book which is named ‘To Imagination’ which poignantly details the joy of the imagination and how we are never truly alone because we have our imaginations to imagine light in even the darkest of times. Another of my favourites was number 21 ‘The Old Stoic’ which was surprisingly relevant giving the times that it was written in as it spoke of how we don’t really need riches or fame in our lives as long as we have courage. And lastly, my favourite of all the poems was number 2 ‘Stars’ which talked beautifully of someone who loved to lie awake at night and look at the stars and how they hated when the morning came because then the stars went away. It was written so romantically and was stunning to read. Overall I thoroughly recommend picking this up if you see it around as it’s a great little book to have lying around for people to look at, or just to read if you are in the mood for some pretty poetry. What are your thoughts on poetry? Do you have any particular favourites? P.S I have been getting nominated/tagged in a lot of tags and awards recently and I’d just like to say thank you to everyone nominating me, it really means a lot and makes me very happy. I am working on them so look out for them appearing on my blog soon! Sounds great! I don’t read alot of poetry either, but I ‘ll add these to my tbr inshAllah. Hi! Thanks for commenting! I hope you enjoy them when you get round to reading them!